As the festive season approaches, perhaps we should spare a thought for the many churches and Christmas tree farms who, this year, have suffered at the hands of thoughtless thieves. We only have to look at recent news reports to see the scale of the problem and the often devastating effect caused by these thefts. In the quiet village of Elmswell in Suffolk, St John's Church has been standing for over 500 years. Many generations of villagers have gathered in the church for weddings, baptisms and memorials as well as Christmas and Easter celebrations. As this BBC report explains, on 10 November this year, the eve of Remembrance Day, the rector went into the church to make preparations for the special memorial service, only to find that water had poured in through a hole in the roof during the night and damaged some of the interior fixtures. The hole was the result of thieves having stripped the church roof of its lead. Quick temporary repairs were made thanks to help from local firefighters (as seen above) and the parishioners attended the service the next day undaunted by having to stand in puddles. The church now faces the task of refurbishing the roof and repairing the interior fixtures. Given the age of the church, as with many in Great Britain, general maintenance is already a very costly exercise so having to raise additional funds to put right the damage caused by thoughtless criminals is not an inviting prospect. If you think that is a shocking story, then spare a thought for St Mary’s Church at Baconsthorpe which is 800 years old. In 2015 and 2016 its parishioners worked hard to raise £120,000 for necessary restoration work. 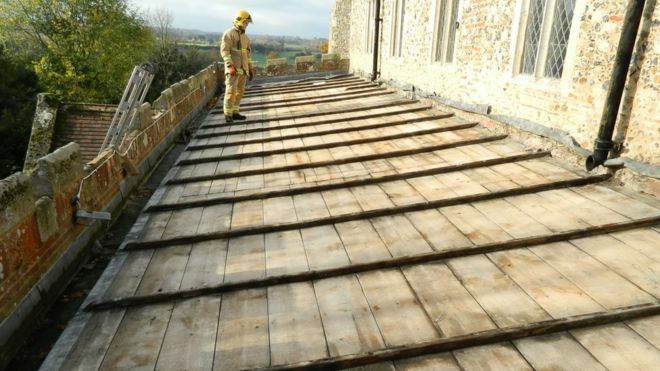 Shortly after the work was completed, thieves struck and stripped the roof of its lead, worth tens of thousands of Pounds, thereby putting the church in danger of closing after 8 centuries. Read more about the need for improved church roof security and how cable detection sensors can help deter and detect would-be lead thieves. 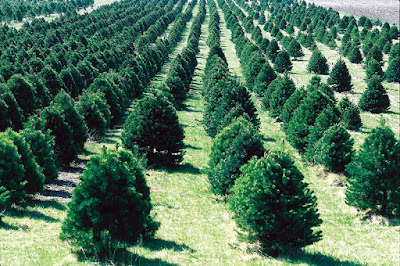 Christmas tree growing is a serious business and whilst it may be obvious that in the run up to Christmas thieves will target farms which commercially grow fir trees, it is not just a matter of a few trees being chopped down and stolen. In looking to make as much money as they can, criminals have been stealing large numbers of Christmas trees as well as the forestry equipment which the tree farmers keep on site. It is not surprising therefore to read about Christmas tree farms increasing their security during 2017. In Ireland, Christmas tree sales both at home and in exports, benefit the economy by an estimated annual revenue of 21 million Euros. County Wicklow has the highest concentration of Christmas tree farms in Ireland and it is there that tree theft is a serious matter. Each year an average of 2,000 Christmas trees are stolen from the farms with a cost to the farmers of around 100,000 Euros. The good news is that there is now an effective security scheme in place throughout the county to combat this specialised crime and many farms have installed CCTV systems and motion detection sensors. Read more here about this story. Thousands of miles away we heard this story about Christmas tree farmers in New Brunswick who have been working to prevent a different type of crime on their farms - that of 'tipping'. This is where criminals choose not to steal the trees but to cut off the branch tips which they later sell for wreath making. This might not sound like a serious problem but in fact the damage to the trees means they are either ruined or have to be allowed to grow longer to recover before they can be marketed. So the cost to the tree farmers can be considerable. So next time you see a Christmas tree, especially if it happens to be inside an old church, stop and think about the security they need if they are to be a feature of Christmas in the years to come.